Home » Uncategorised » Latest local business gathering! The latest local business gathering! Following the B4B4WA (Breakfast for Business for Waltham Abbey in February, we had our first T4B4WA (Tea for Business for Waltham Abbey!) on 26th April. 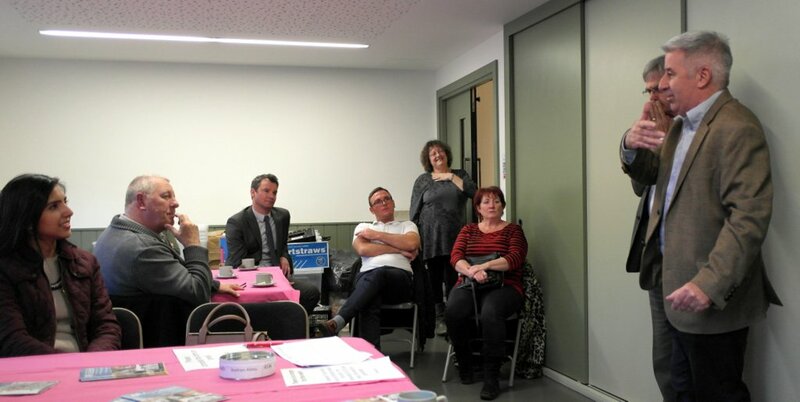 This took place at 6pm in the newly extended and re-furbished Epping Forest District Museum and was attended by 22 local business and civic folk. The next tea may be a little earlier so there is no gap between closing for the evening and coming along to our meeting. We are seeking to arrange such gatherings at times to suit, in order that everyone has the opportunity to attend some, if not all, of the meetings. This event had three elements. The first is always to help local business owners to talk to each other! Sounds simple, but the more we talk and get to know each other the better we can work together for the benefit of all. The second element will always be a short reminder of what the WATP stands for, and the immediate plans it has for further development and participation, and this time we had element three which was a talk by Tony O’Connor highlighting facts about the museum, and about other relevant historic and current activities that are all part of the Town’s rich heritage. We have so many opportunities to ‘sell’ Waltham Abbey, and it is this that will bring in more visitors and increase footfall, for the benefit of all local businesses. We have plans to make membership of WATP much more relevant and beneficial, and details of this will be ready to be rolled out at (or before) our next meeting. This should be toward the end of June, as we anticipate a bi-monthly get-together, each at a different venue in Town. If any business would like to offer their premises to host a breakfast or tea, do please let me know! So, a big thank you to those folk who kindly came along to this meeting, thus adding to the total number of local business people who have attended both events this year. Probably representing 35 local business so far, but our aim is much higher, and that is to have 75% of businesses become a part of WATP because “Together we are strong”.